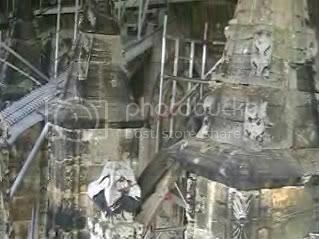 I have written a number of articles on the towers or steeples of Rosslyn chapel. I came across an interesting steeple that appears to have a goat’s head carved in stone on a steeple. A goat’s head would be important because of it’s symbolism to the freemasons. One of the Masonic initiation rituals is called “riding the goat” The goat has symbolism linked with Pan and Dionysius or Bacchus. Pan is god of shepherds, hunting, wild mountains, and nymphs. Pan is symbolism of fertility, spring and his home is Arcadia. The god Zeus suckled goat’s milk when a child by Almathea his foster mother. Capricorn is the constellation of the goat. It starts around December 22 and ends around January 22 which is the time of Jesus’s birth in the church calendar. Saturnalia was celebrated by the Romans. It is celebrating the birth of the sun with winter solstice. John the Baptist birthday was celebrated during the Summer solstice. 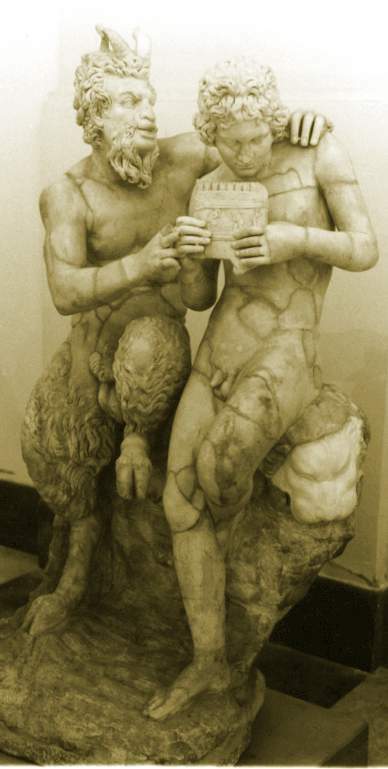 In Neopagnism Pan is associated with male sexuality and virility. “In 1933, the Egyptologist Margaret Murray published the book, The God of the Witches, in which she theorised that Pan was merely one form of a horned god who was worshipped across Europe by a witch-cult(1)” Wicca has Pan connected with the horned god Cernunnos and India’s Pashupati. Cernunnos is a celtic horned god of nature and fertility. In the chapel below is the green man entwined with vine and leaves throughout the church possibly in reverence to Cernunnos or Pan. Greek Dionysus is the god of winemaking and harvest of the wines. Roman Bacchus is carried a fennel wand with a pine cone. Many Dionysian cults which expressed freedom conducted rituals in which it was said members were empowered by the god himself. Dionysus is the cult of the dead in which he is the communicator between the living and the dead. The legend of the Templars and Baphomet is connected with the word. Alleged name of the idol which the Templars were accused of worshipping. (According to l'Abbé Constant, quoted by Littré,1 this word was cabalistically formed by writing backward tem. o. h. p. ab., abbreviation of templi omnium hominum pacis abbas, 'abbot' or 'father of the temple of peace of all men.') Hence Baphomet·ic a.
Oxford English Dictionary, Oxford: Oxford University Press, 1984 (23rd Printing) p. 659. Ammon of Mendes was a ram headed Egyptian god who was later changed to a goat head. Mendes is a town on the Nile. Ammon (the concealed) was associated with the divinity of nature. Reproduction and cyclical regeneration. The Greeks later named him Pan. Ammon was for many ages the main god of Egypt . The light giving sun god is Amen Ra (the hidden One).Amen is said after many prayers. Rosslyn Chapel was called Saint Matthew's Chapel originally. An interesting line pertains to goats and sheep in St Matthew. Goats tend to be more aggressive and wanting freedom verses sheep who are passive and follows obediently with the fold. It is interesting that the goat's head was carved on the steeple by the masons of Rosslyn. Rosslyn Chapel is a tribute to nature with it's sky of pentacles, flowers, vines, and green men. The goat's head is a tribute to the god of nature, fertility, and light. "Riding the goat", a saying by freemason's referring to one of their rituals. Saint Clair was named Grand Master Mason of Scotland. William Schaw is looked upon as the founding father of freemasonry. It moved from an organization of masons to include later those who were not . The symbolism of the goat seems to have been important to the masons of Rosslyn. This goat has climbed to one of the highest points on Rosslyn steeple.